Jim Clemens Collection No.20. 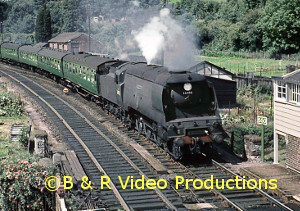 This is the third volume in a trilogy of videos on Scottish railways from the JIM CLEMENS archive film collection and covers the Border region of Scotland south of a line from Glasgow to Edinburgh. 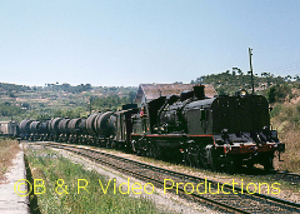 Some of the SLS/BLS Easter railtours were good opportunities to visit long lost branches that were just hanging on for freight but passenger working had ceased years before. Covered in this volume are the RESTON to DUNS, TWEEDMOUTH to WOOLER, COLDSTREAM, ROXBURGH, JEDBURGH and GREENLAW lines. Then MORPETH to REEDSMOUTH, BELLINGHAM, SCOTSGAP and ROTHBURY lines on the 1963 WANSBECK WANDERER Railtour. A main line now closed was the PORT ROAD to STRANRAER and with a Jubilee hauled railtour, we traverse the route and also visit KIRKCUDBRIGHT, WHITHORN and GARLEISTON. A second run is with a normal service train to STRANRAER. North to GIRVAN and AYR with a B1 around MAUCHLINE and MUIRKIRK; Caley No.123 around AYR and KILMARNOCK in 1962. There is also a railtour over the WAVERLEY route with an A4. The Ayrshire coalfields are seen at WATERSIDE. 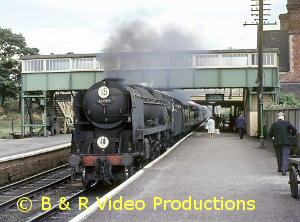 Filmed in colour from 1962 to 1966 some interesting motive power is seen from Caledonian types to Standards. The odd Duchess comes in as well. 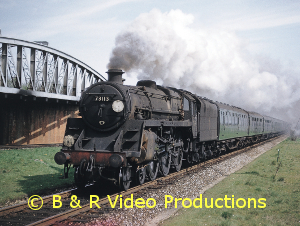 A detailed commentary and authentic sound-track completes a nostalgic look at the railways north of the border.